Add all dry ingredients to large mixing bowl. Combine dry ingredients with a whisk. 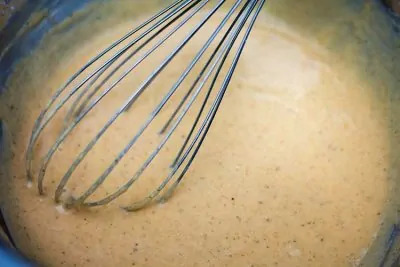 Whisk in water and milk until batter has no lumps. Add cauliflower florets to batter. Mix well to evenly coat with batter. 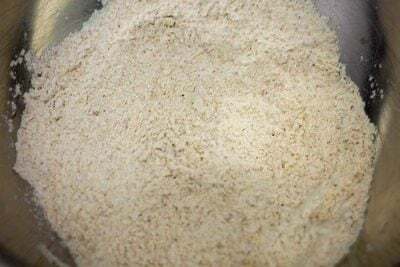 Remove florets one at a time and transfer to a separate dish so that excess batter can run off. 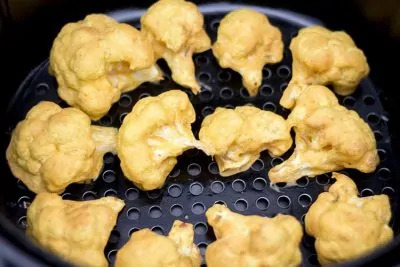 Add battered florets to air fryer basket in a single layer. Also, try to keep them from touching (if possible) so that all sides can get direct heat. Cook at 350 degrees for 15 minutes. 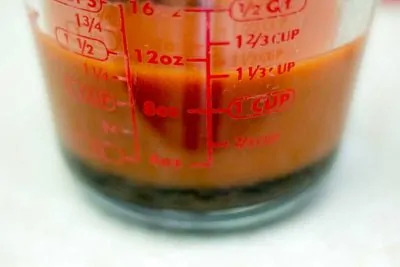 Meanwhile, in a small pot (or in microwave) – bring hot sauce, butter, and molasses to low simmer, mixing well to combine. 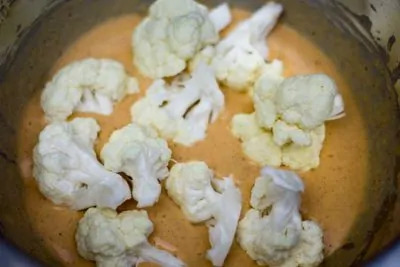 Once cauliflower is done cooking, transfer to a bowl and cover with sauce, then toss to coat. And This is the Amazing Result! 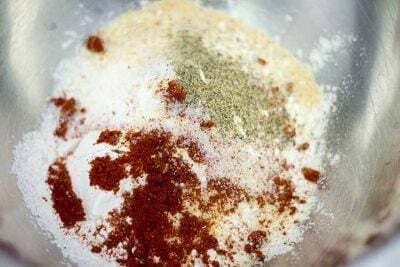 In a mixing bowl - combine all dry ingredients (flour, garlic powder, onion powder, smoked paprika, salt, black pepper) then whisk in water and milk until batter has no lumps. 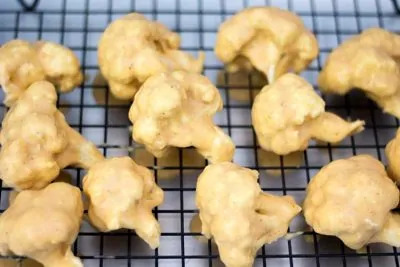 Add fresh cauliflower florets to batter and mix well to evenly coat with batter. Remove florets one at a time and transfer to a separate dish so that excess batter can run off. Meanwhile, in a small pot (or in microwave) - bring hot sauce, butter, and molasses to low simmer, mixing well to combine. Then remove from heat. 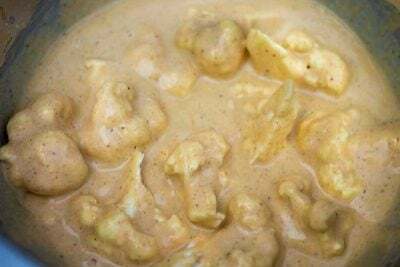 Once cauliflower is done cooking, transfer to a bowl and cover with sauce, then toss to coat. Serve with your dipping sauce of choice, or none at all. Enjoy! Where does the molasses come in? In step 5, you incorporate it into the sauce. Makes for a minimally sweet sauce, so it’s not just spicy. We are big fans of layers of flavor! I’ve only had the fryer for about a week, but I love it! 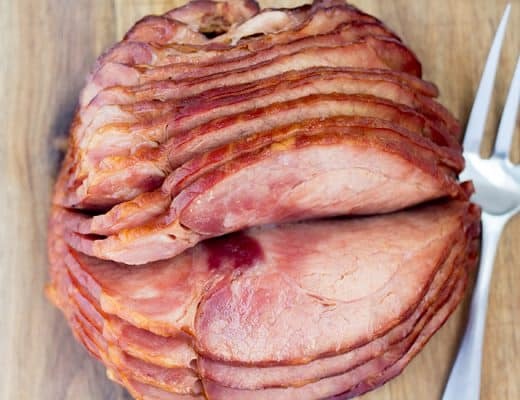 The idea of it is similar in nature to a convection oven, but the way the air moves around is much different, which is why you can get that “fried” quality in food. Highly recommend! Just made these! 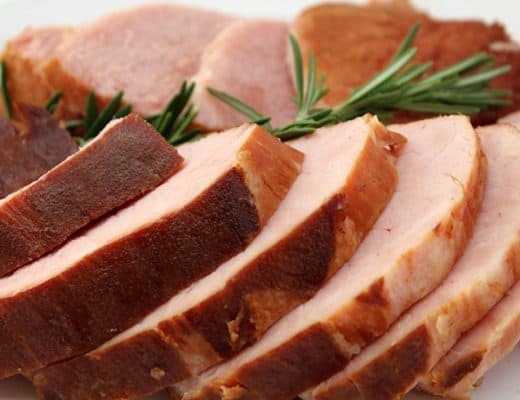 Delicious and satisfying, thank you for sharing your recipe. Did not use the molasses since I did not have any but still great nonetheless. 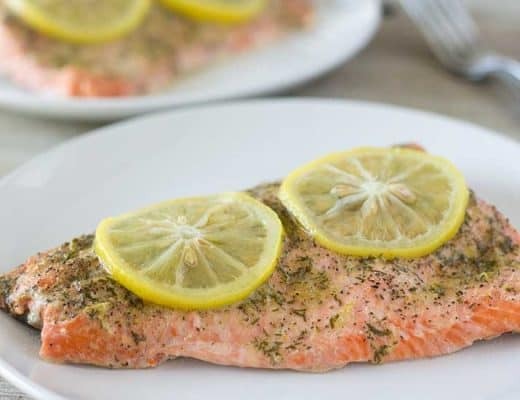 wow, I thought I would not have a good outcome given I only had whole wheat flour and almond milk… but it worked really well – and you’re so right, with this being the first recipe where I used the Air fryer – what a hit! Alisa–Thanks for commenting that the recipe works with WW flour since that’s what I was planning to use. Look awesome – however we avoid oil (vegan butter) and sugar (molasses). Other suggestions? Maybe I will try my date paste and applesauce with a little hot sauce??? Let me know how it turns out for you though, if you try it. I’d love to hear. Can I use butter milk? That’s all I have. I think that should work. I love buttermilk! 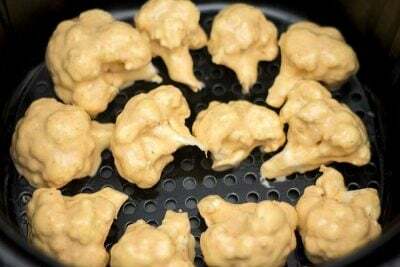 I tried making air fryer Cauliflower but they did not come out good. I want to try this one. Mine wouldn’t cook and they dried out. Does your recipe cook them tender or do they stay hard. 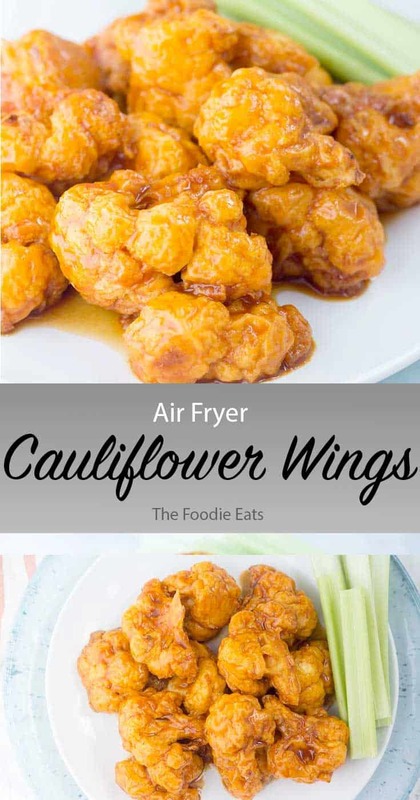 I like the good ole fried cauliflower but really want to try a food airfryer recipe. Tender inside, slightly crispy outside. Please let me know how it comes out if you try it! Oh my gosh. These are SO freaking amazing!! We have done these baked before but just bought my air fryer and it is so much faster. Worked well for the “cutlet” size cauliflower too for sandwiches. Paired perfectly with aome sunflower seed ranch! … Oh and the molasses… NICE TOUCH!! Should you boil the cauliflower first to make more moist & tender? I just made these using romanesco instead of cauliflower. They came out super crispy on the outside, and soft on the inside. Perfect! Thanks for sharing! Kudos for being creative and switching things up! And I’m so glad that you liked it! What I love about the Air Fryer is I don’t have to wait to hear up a big oven & waste my propane has on it! It saves time & money! Especially when you are only cooking for 2! We feel the same way! That’s why we use it so often. It’s very versatile. 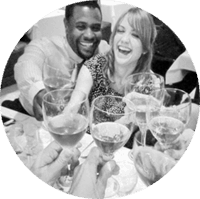 We have the GoWise USA and we love it! I’ve also heard great things about the Philips brand. I’m making this for the first time and I’m a little nervous l. It smells amazing though. I used almond milk and I have a premade buffalo sauce. 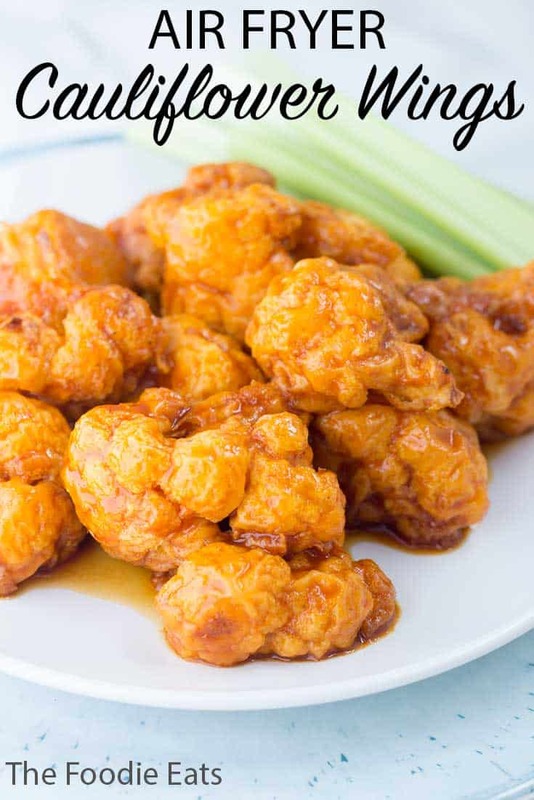 I use my air fryer almost daily (Christmas gift) so I hope this can be one of our regular recipes! Just made this Absolutely delicious!!!! I added a tablespoon of nutritional yeast which gave it a cheesy flavor. I am going to a cook out today and think I will take some with me. Thanks Much!!! 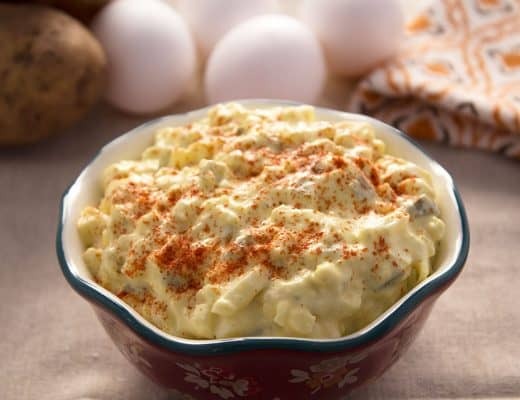 my batter doesn’t stick to the cauliflower, what am I doing wrong? Is it thin and runny? Or is it thick? It should be on the thicker side. I modified the sauce to my normal buffalo sauce, but this is great! Will definitely make again! The worst tasting thing I’ve had in a long time. Just have the chicken wing. 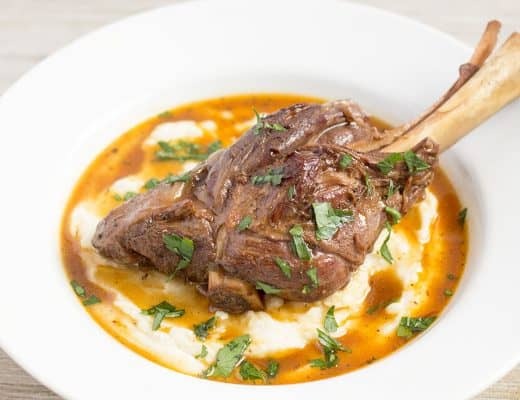 Chef Gary we use a Ninja air fryer and this will be our next recipe to try! 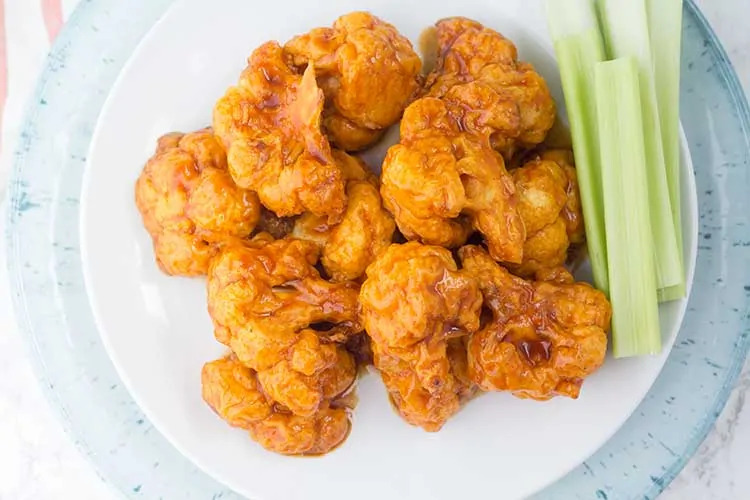 Me and my girlfriend love buffalo cauliflower and the air fryer is perfect because it cooks just enough for 2 people. By the way your response to Louise was alot more diplomatic than mine would have been lol. Where does the 2165mg of sodium come from? Seems like a lot per serving or am I just doing the math wrong? It comes from Frank’s Redhot Wing Sauce. Seems like soo much for a serving. But thanks for in info! This recipe turned out perfect!! I used Franks Buffalo sauce instead of making my own but it was a big hit at the superbowl party that I went to!! 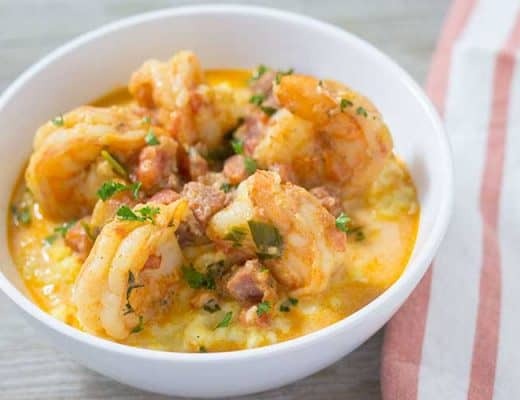 This was a disaster for me…it was mushy and soggy and not good…the taste was ok but the texture had me spitting it out. 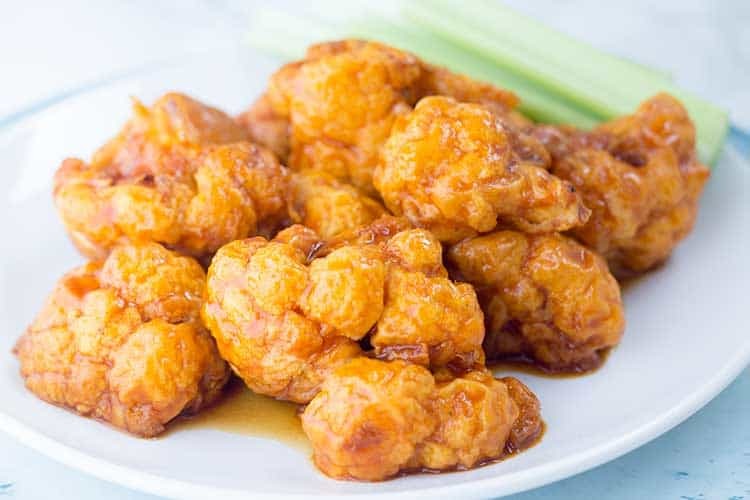 I’ve never substituted cauliflower for “wings”. maybe I was expecting too much. Sorry to hear that. 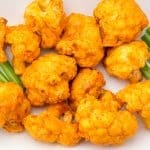 While the texture of cauliflower is very different from chicken, it shouldn’t have been mushy or soggy. 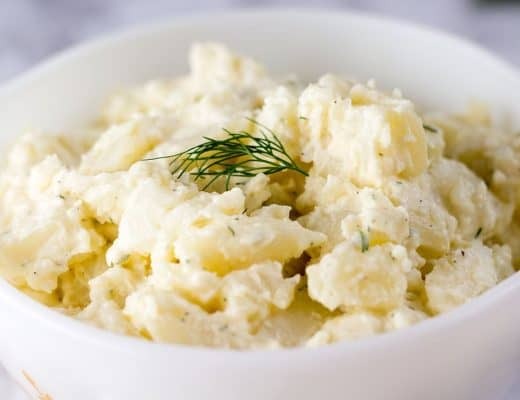 Did you use fresh, uncooked cauliflower? Going to give these a try. I have a head of cauliflower that I need to use up this weekend. I also heard of a tip where after you coat in the batter, you toss in panko bread crumbs. Makes it crispy. Thanks for the recipe! 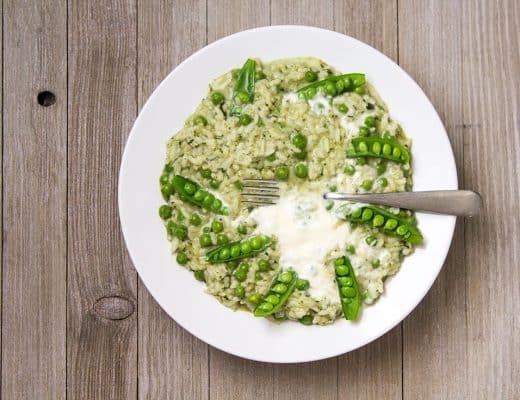 This recipe gets 3 stars… and only 3 for taste. I cooked my cauliflower exactly according to directions. They all stuck to the basket. And they were not crispy. They did taste great though which is why I give the 3 stars. Came out crispy. Until sauce was put on, then outside got soft. Didn’t care for it being that soft, almost soggy. Lol I’ll try once more with the batter a bit thinner. Was maybe too thick, made it as recipe called for.